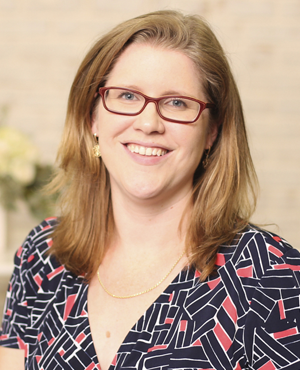 Sarah, a Delaware native, is a strategic communicator with more than a decade of experience crafting clear, compelling messages to support organizational goals. She currently serves as Communications & PR Manager at the Delaware Prosperity Partnership (DPP) – the economic development organization for the state. As such, she promotes the state of Delaware to local, national and international audiences as the premiere place to do business. Prior to joining the DPP, she served as a communications manager for Nemours/Alfred I. duPont Hospital for Children in Wilmington, where she managed all internal and external messaging in support of fundraising and stewardship in the Delaware Valley. She started her career at United Way of Delaware, where she launched their digital marketing strategy and strengthening their traditional marketing, working with corporate, nonprofit and governmental leaders. Sarah routinely provides volunteer leadership to local nonprofits. Currently, she is board president for the Fresh Start Scholarship Foundation, a 501 (c)(3) that provides scholarships to local women with financial need. She has served on the board since 2014. Previously, she volunteered for organizations including the American Cancer Society and the Delaware Association for the Blind. She has a BA in Communications, with a concentration in journalism and an MA in Public Policy & Administration, with a dual concentration in community development and nonprofit leadership, both from the University of Delaware. She was a 2017 Fellow of Leadership Delaware. She was recognized among the “40 Under 40” by Delaware Business Times in 2017. She lives in Pike Creek with her husband, David, and a small menagerie of pets.